* Improved layout and design and lots of new art. * Flavour text from dozens of literary sources that can help stimulate interest in the various sorts of Experts presented in this book, suggest how they might be used, or show them in a different light than usual. 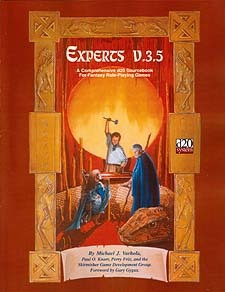 * The Specialist, a new basic character class that players can use to create versatile "adventuring Experts" of any sort. * Many new skills, more than 100 total. * Convergence Tasks, activities that can be accomplished as the result of having ranks in two or more skills, allowing characters to perform relatively specialized functions without inundating the game with obscure, rarely-used skills. * A greatly expanded section of nearly two dozen relevant feats. * Updated and improved versions of the Guild Master and Militia Leader prestige classes, which have been enhanced to make them more appealing for use as both player - and non-player - characters. * A new prestige class, the Spellcrafter, which can allow Experts, Specialists, and other characters to gain specialized magical abilities that they can use to enhance their mundane abilities. * An expanded appendix of Expert work areas, many of them based on digital photographs of models produced by the Miniature Building Authority and Dwarven Forge.